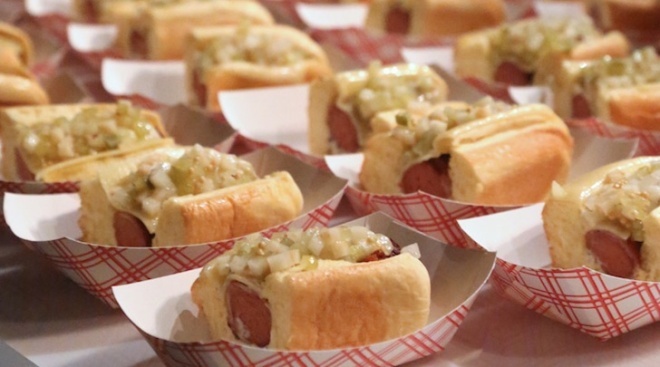 Humm Dog, a bacon wrapped hot dog under a melted slice of gruyere with black truffle mayo and celery relish, from Daniel Humm. The announcement of Food & Wine Magazine’s Best New Chefs signifies the start of spring. And despite the “out like a lamb” downpour during the publication’s tentpole event, the mood inside the Edison Ballroom in Times Square was as warm as the season we all yearn for, and deserve. With passed chicken confit bites served on buckwheat crepes from Koran Grieveson, to the rich and spectacular Humm Dog from Daniel Humm, a bacon wrapped hot dog under a melted slice of gruyere with black truffle mayo and celery relish, or the perfectly balanced sweet and spicy hand-pulled noodles with Szechuan shrimp and sausage from Stephanie Izard, the evening, emceed by Dana Cowin and Christina Grdovic, was a celebration of the publication’s namesake, Food & Wine.